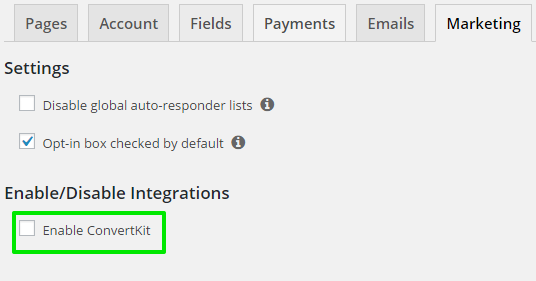 In your dashboard, head to MemberPress -> Activate -> Addons and click to install the ConvertKit addon. Once it's installed, activate it and you'll see the ConvertKit integration available in the "Marketing" tab of the MemberPress Options page. Login to your ConvertKit.com account settings to get your API Secret key. Once you have obtained your API Secret, paste it into the ConvertKit API Secret field shown below. Once MemberPress has established a connection, indicated by the green All set! text, select your ConvertKit Tag from the drop-down option. The Per-Membership Tags are a great way to automatically segment your members by their Tags for marketing purposes. 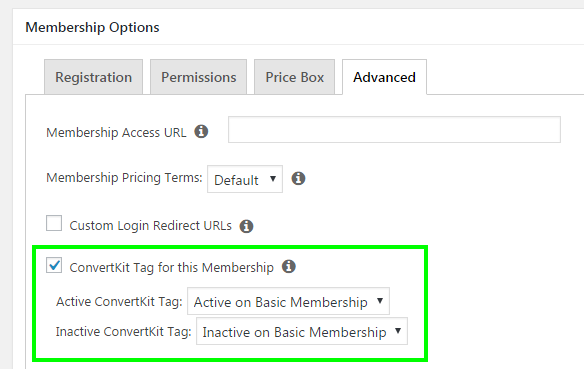 Once you have ConvertKit enabled, a new option becomes available under the "Advanced" tab of each Membership. This option allows you to select an Active Tag that only members who purchase that Membership should have added to their account. Members will have this tag automatically added to or removed from their accounts depending on their current Subscription status for this Membership. The Inactive Tag is also automatically added/removed. The two tags will alternate based on the User's status on this Membership level. These Tags must be different from the Global Tag you have specified in the Options, and must be different from other Per-Membership Tags you have set in other Membership levels as well.